Public Enemy, the rap group from Long Island, New York, is one of the most influential groups in the emerging genre of rap music. Borrowing heavily from the rhetoric of black power, a generation earlier, the group achieved both commercial and critical success. Public Enemy included rapper Chuck D (Born Carlton Ridenhour on Aug. 1, 1960), rapper/hype man Flavor Flav (born William Drayton on March 16, 1959) and featured Professor Griff (born Richard Griffin in August 1960) who managed and choreographed their backup dancers. Public Enemy was formed at Adelphi University in 1982 where Chuck D and record producer Hank Shocklee hosted a college radio show. Shocklee encouraged Chuck D to begin rapping and they recorded what would eventually become the first Public Enemy song: “Public Enemy No.1.” The song eventually made its way to Def Jam co-founder Rick Rubin who immediately signed the group. Def Jam released Public Enemy’s first album “Yo! Bum Rush the Show,” in 1987. The album’s political focus demonstrated a marked change in the direction of hip-hop. They patterned their image largely after black power groups from the sixties, particularly the Black Panthers. 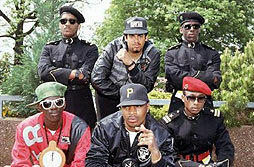 Public Enemy’s backup dancers wore outfits inspired by the Panther’s traditional attire. The black power influence became fully realized on Public Enemy’s second album “It Takes a Nation of Millions to Hold us Back,” released in 1988. With pro-Nation of Islam lyrics like “The follower of Farrakhan/ Don’t tell me that you understand/Until you hear the man,” the album stirred controversy throughout the United States. Chuck D’s pro-Nation of Islam lyrics were not the only thing that caused controversy for Public Enemy. Accusations of anti-Semitism were also leveled at the group. In an interview for the Washington Post in 1989 Professor Griff said “Jews are responsible for the majority of wickedness in the world.” Even though the rest of the group distanced themselves from the statement and Griff was fired, the statement still managed to change many people’s perception of their music from pro-black to anti-Jewish. By the 1990s Public Enemy continued to embrace revolutionary ideas. Now they no longer urged the overthrow of the government and focused their attention on the way record labels do business. As MP3 file sharing became increasingly popular among young people, Chuck D supported this means of distribution to break the stranglehold the companies have on the transfer of music from the recording artists to his audience. “The industry is running scared from technology that evens out the playing field.” Chuck D held to his word and Public Enemy’s following album “There’s a Poison Going On…” appeared online before its in-store release. In 2004 Rolling Stone Magazine listed Public Enemy #44 in “The Immortals,” a list of the greatest artists of all-time. Public Enemy was the highest ranked hip-hop group in the ranking. Stacy Gueraseva, Def Jam, Inc. (New York: One World, 2005); James Haskins, One Nation Under a Groove: Rap Music and its Roots (New York: Hyperion Books, 2000); Stephen Thomas Erlewine, "Public Enemy." Allmusic.com 14 Mar. 2007. http://allmusic.com/cg/amg.dll?p=amg&sql=11:48jgtq6ztu4o~T1. Stacy Gueraseva, Def Jam, Inc. (New York: One World, 2005); James Haskins, One Nation Under a Groove: Rap Music and its Roots (New York: Hyperion Books, 2000); Stephen Thomas Erlewine, “Public Enemy.” Allmusic.com 14 Mar. 2007. http://allmusic.com/cg/amg.dll?p=amg&sql=11:48jgtq6ztu4o~T1.